"The difference between you (I-Change) and other consultants who approach me (and they do) is that they say something like 'You are starting from here, and need to get to there, and this how we can take you there.' Whereas I will say to you I think I'm starting from here, and you will challenge and explore that, and we usually agree I'm not quite where I thought I was. Then I will say I think I need to get here, and you will ask if I have considered various other options and factors, and again I may well adjust my thinking in the light of your questioning. Then you go off and design a process to get me there, and if necessary, you will adapt it en route to ensure we get there"
"Richard is a rare expert in his field of "change" - he won't let you escape reality nor miss the hard (�) or soft (people) issues . His work has a great impact." "Richard is a dynamic, professional and thoughtful consultant with strong client focus." "The results of this project have far exceeded our expectations. Richard's mix of people skills and experience of "hands on" change management took us through the process of change step by step, encouraging buy-in and accountability from all involved." "Richard can only be described as world class when he is delivering his 'Catalyst for Change' programme." "I have worked with Richard on several occasions since 2006. Using his practical insights drawn from many years of experience, he has provided consistently first-class support in developing and implementing successful change management plans." "Richard helps you see the wood for the trees, then offers creative ideas to bring about improvements followed by a dogged determination to help you make the changes happen"
"I have worked with world class facilitators and coaches, but in my view Richard is up there with them. He has an uncanny ability to cut through the crap, quickly get to the root of issues, and point you in the right direction. That's partly why I still work with him over 20 years after first meeting him." "The problem was a highly intelligent team of change managers were stuck in the old paradigm of influencing initiatives which meant that there was very little progress. Richard injected some new thinking around change and with his superb facilitation we made important breakthrough. The result of Richard's intervention moved the team forward by at least 6 to 8 weeks." "Proper attention to technical and human aspects of a Technical Operations function guarantees a high probability of success. Using the services of a trained facilitator, Richard Cooke, in attending to some of the complex challenges of running a global technical operation improved the outcome of team based activities. Richard would work with management to prepare the team for the task and to make improve the effectiveness when the team came together. This allowed the team to focus their attention on the challenge while Richard would concentrate on the process needed for a successful team effort. Tools used by Richard in the support of the team were carefully selected from the best team based practices of successful leading companies around the world." "I was the Organisation Development Director working in HR. The problem was that I was running a 2 day transformation workshop for the Asia Managing Director and his direct reports in Australia with only two days notice. Richard came to my rescue by helping me put together an agenda and in particular produced some diagnostic tools for use with the Area Managing Director and his team. The result was excellent with feedback from the team indicating that the most valuable part of the workshop was the use of the tools." "We had a complex problem to resolve, with a diverse group of people from different technical and cultural backgrounds. We needed to make an investment decision that was crucial to the Company's long term strategy. As it was a multi-million pound investment decision, we only had one chance to get it right. We needed help in preparing, designing and running the meeting, so we brought in Richard who did exactly that. He ensured that we were all fully prepared, that the meeting was effective and efficient and we achieved our goals. His contribution made sure that everyone was, and felt, heard. As a result we found a strategy that worked, was supported and successfully implemented. Richard is one of the very best facilitators I've ever worked with." "This was a very useful session, it brought the team together with a good facilitator. Richard showed excellent control and facilitation skills. The day was interactive in a way that those who do not normally contribute to the group joined in." "They say 'It�s lonely at the top' and by gum that can be very true! In an extensive working relationship with Richard, one of his very best bits of work was for us involved a small counselling and facilitation project. Richard's insight into business, people, change and accounting equipped him perfectly when helping us tackle a major business decision. A significant commercial opportunity presented itself, but it was too sensitive to discuss with even my top team. Whilst I have many friends and colleagues in the industry, the potential of the opportunity was such that I needed to deal with it alone. It was always going to be hard to be sure of making the right decision, and more so with a tough deadline. If I had not acted with sufficient pace the moment would have been lost, if I acted without due caution even more was at risk. Richard designed a simple process to help me. He established some principles and then, once the right decision was in sight, facilitated the process in some critical meetings that required a structured approach and an equal voice for all. The value of Richard�s help in this matter outweighed the cost hundreds of times over. A claim I can only make on the very rarest occasions for our own consultants! Richard created a completely safe environment for me to openly explore my concerns and issues. I found him to be a good and non-judgmental listener. He quickly distilled my concerns and focused my thoughts on the issues I wanted to address. He never let us get bogged down, and kept things moving, helping me to see the wider picture. Over the short period we have worked together I (and others) have noticed a definite change in me. I know this process is working and can now see what I need to do to make it even more effective. Now it is down to me�"
"Following the course at Henley, Richard has supported and coached me through the assessments and also through the period of uncertainty and change within the business. Richards's comfortable and relaxed style helped me work through new evaluation techniques and models. At each subsequent session, my trust and confidence in Richard developed, that allowed Richard to challenge further areas for review. Richards's flexible approach, subtle listening skills and questions found me talking about things I'd never considered or thought to be influential. Now, at the end of the prescribed sessions I question how I ever managed without them." "The coaching was very, very useful. Richard gave me a structure that helped me to work through specific and real issues. The sessions were very practical and I found that learning this way, via real problems much more useful than rote learning of models, as I could immediately apply it. Talking things through with Richard has been very helpful"
"Richard helped me to see the business world from a different perspective. He was very good at helping me find more and smarter options. He has a depth of experience and a wealth of anecdotes which always helped me to see things differently and more clearly. I found both his website and his blog very valuable adjuncts to the sessions to support me in-between times and would recommend them. Some coaches can be rather mechanical &mp; academic in their approaches, but Richard was much ore dynamic and practical. He always used real examples to help make his points. He brought a fresh and contrasting perspective to our sessions, which I valued." �We were faced with the specific challenge of how to unite a very new team of very bright people. So we decided to invest in �Team Challenge�. We had all of the usual commercial obstacles; the pressure on our people�s time & the costs associated with removing large numbers of people from the business at the same time to name but a two! On top of this we had to face a small but significant number of people reluctant to sign-up due to scepticism or fear. 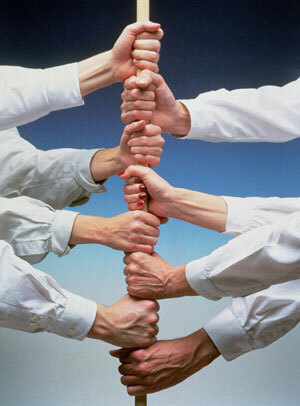 Many of our people have come from large organisations where team-building and personal developments are commonplace. Whilst some people relished the thought of a day out of the office running around, few thought it would be particularly valuable. How wrong they were and how significant the course was! "We were looking for a completely new take on our senior management conference � themed on our new core values. It had to be fun, highly participative and it needed to end with managers fired up to go back to their airports living the values and spreading the word. In effect it had to be a real quality dialogue with 140 senior managers! With four weeks to plan the event I had our values, a delegate list and a venue but very little else. I met up with Richard and after a full day of discussion, questions and suggestions I was confident that we would be able to deliver something special. Richard�s enthusiasm, expertise and total attention to detail ensured an event that delivered. He guided me through the design of the day and kept reminding me that whilst we were inevitably focused on the event day itself, it was simply a means to an end and only part of the journey. This was hard to see at the planning stage but as the conference day unfolded I realised that we were indeed putting ourselves into a whole new ballgame. At the end of the day one delegate said that we should stop referring to �the� values and call them �our� values. This brought great applause and was exactly what I had hoped for." "Only one other organisation I know could have designed & facilitated this so well ... and they no longer exist"
"As we hoped and expected from our own experience of catalytic intervention with client organisations, the use of an external facilitator to tease out issues and drive discussion through a structured process paid early dividends. The SPT process provided a logical sequence for linking individual objectives with a strategic business plan. All our previous planning had started with corporate business and financial objectives and thus had missed addressing the crucial aspects of personal needs and motivators of management and staff, our cultural health as a group and our organisational suitability and evolution. The SPT process map presented a tall order for a one-day session, but here again was where an experienced external facilitator could control the pace. The map is clear and intuitively sensible. Extremely relevant points which had not been clearly apparent from past internal discussions surfaced early in the day during an exploration of individual personal and business objectives. The facilitator�s detached role encouraged frankness, and the probing of sensitive issues � which only an outsider could do effectively � teased out problems and further issues that needed to be addressed. From the first step in the process, we felt energised, and the level of energy in the room did not diminish until late afternoon. As for your facilitation, you succeeded in energizing the group at the outset and managing the pace well throughout. You knew when and where to probe, and you struck a good balance between bluntness and sensitivity. We enjoyed the day, and remain committed in our pursuit of the action plan set out. We also look forward to your working with us as we stride, stumble, dust ourselves off and stride-on toward our objectives. Your relentless prodding is appreciated! Richard did a great job helping me to get a new team on board and performing. His advice, insight and ability to turn chaos into clarity were greatly appreciated. Even though I'm about to leave for Japan ( in two hours ! ), I still find time to read your articles, and I do read them all! This is a classic - it really makes the point - it's truly excellent.